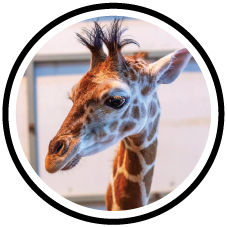 This year’s Zoofari fundraising event offered many exciting auction items, including the opportunity to name the youngest member of the giraffe herd, a female giraffe born on August 9th. After the high bidding couple, Terry and Laurie Ray, offered to make donation to the Zoo and allow someone else the opportunity match their donation for the naming rights. John and Mary Muratore stepped up and won the honor of being able to choose a name for the calf – the name they chose was “Rocket.” She is currently behind-the-scenes. On Thursday, January 17th at 3:45 p.m. the public will be able to see her for the first time at her debut party. Please make plans to join us in T minus 28 days and counting for a “Rocket” launch party with cupcakes and lemonade while supplies last.